An international agri-robotics project based in Lincoln is set to revolutionise farming in the UK. At the start of this year the University of Lincoln, Saga Robotics UK and Berry Gardens Growers began a two-year project to develop advanced autonomous systems to support the production of soft fruit. The project – the largest of its kind in the EU – has been cited as a ‘trailblazing’ project in artificial intelligence by the Department for Business, Energy & Industrial Strategy in its AI Sector Deal. The deal pledges an additional £1 billion of funding to put the UK at the forefront of the artificial intelligence industry. The machines can transport heavy boxes of fruit from the picking point to the collection point, relieving agricultural workers from the heavy work. Ultimately, the machines are designed to increase productivity at the point the fruit is picked. The venture, seen as revolutionary for Greater Lincolnshire as an agricultural region, is being strongly supported by the Greater Lincolnshire Local Enterprise Partnership. Ursula Lidbetter MBE, Chair of the LEP, said: “Greater Lincolnshire is a major food-producing area and the agri-food industry is one of our six priority sectors. 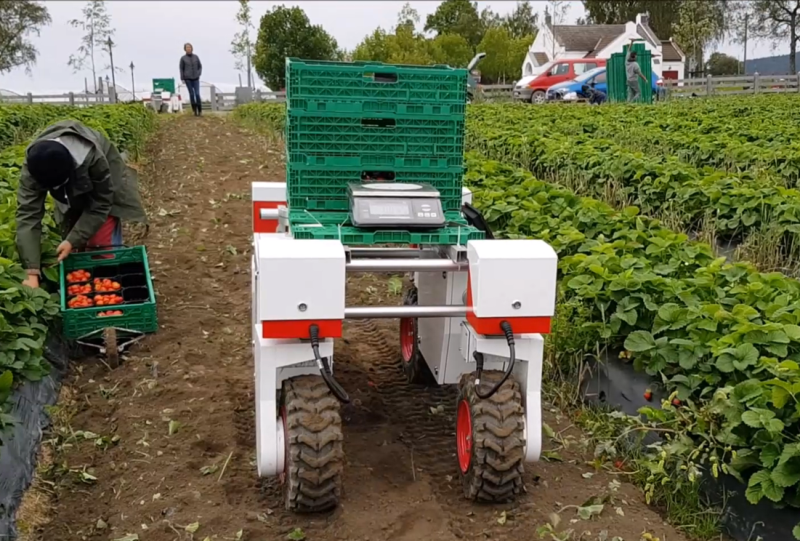 As well as partnering with Saga Robotics UK and the Norwegian University of Science and Technology, Berry Gardens Growers has also enlisted the help from the Lincoln Institute of Agri Food Technology at the University of Lincoln. Simon Pearson, Professor of Agri-Food Technology at the university, said: “We are delighted that Lincoln’s research has been recognised as a trailblazer for AI. Our work is focussed on the agri-food chain and this sector is now entering the digital age.